So far, I have found seven editions in our collections that were published by the famous Ming Dynasty bibliophile Mao Jin 毛晉 (1599-1659). If there is one publishing house whose name will be familiar to those with an interest Chinese books, it will be his: the Jiguge 汲古閣, originally called Lüjunting 綠君亭. Mao Jin started to collect books in his youth, and had family money to support his interest. 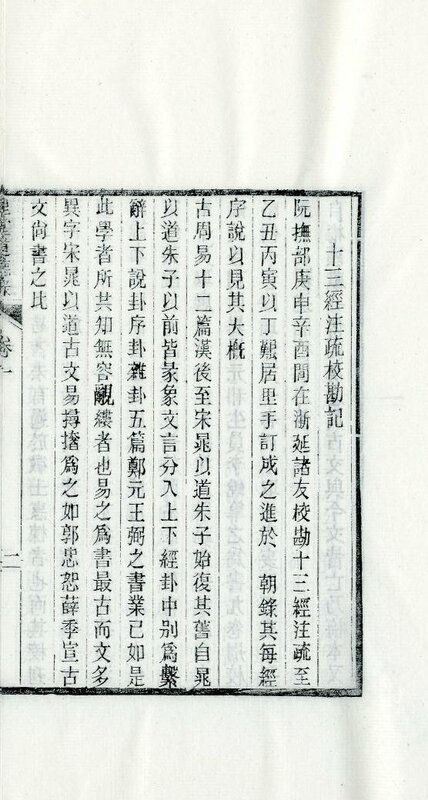 If he was unable to acquire a Song edition, he would make a tracing of it (影宋鈔本) for his library, thus preserving the text and appearance of a number of editions that were subsequently lost. At an early stage of his publishing career he produced editions of the Thirteen Confucian Classics 十三經 and the Seventeen Dynastic histories 七十史, supposedly because of a dream he had while taking the provincial examination in 1627, in which a dragon appeared bearing two pennants, one inscribed with the word jing 經 (classics) and the other with shi 史 (histories). As the dragon is a symbol of the emperor, and the dream occurred at around the time of the Chongzhen 崇禎 emperor’s accession, Mao Jin took this as a divine command to start printing them. All this is recounted in Fang Chao-ying’s entry for Mao Jin in Hummel’s Eminent Chinese of the Ch’ing period (565-566), and further details of Mao Jin’s life and work are too well-known to repeat – there are many accessible accounts both in print and on the internet. 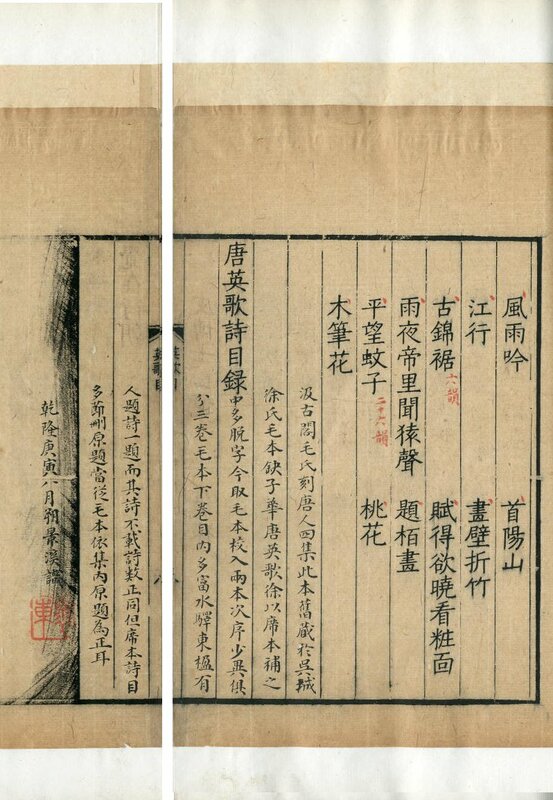 The first printed leaf of the copy is the so-called “cover page” (fengmian 封面). This often gets called a “title-page” by western writers (including me), but wrongly so, as it serves a different purpose. Traditionally, booksellers would spread out their books on tables inside the shop or even on the street, and the “cover-page” was designed to attract attention to them. This is why they so often contained mendacious attributions to famous authors or distinguished publishers. The cover page of Backhouse 477 is visible only with difficulty, as it was encapsulated in a doubled leaf of the interleaving paper when the book was restored in Peking – I will discuss this procedure below. But we can just see the attribution of the editing work and printing (correct, in this case) to Mao Jin, corroborated by two of his seals: 「毛氏正本」 and 「汲古閣」. This is a scholarly edition, and was clearly owned by a scholar. This is evident from the annotations throughout the second work in the copy, the poems of Wu Rong. According to a manuscript colophon after the table of contents, the copy was originally owned my a “Mr Xu of Wucheng” 吴城徐氏, but as it lacked the poems of Wu Rong, these were supplied from a different edition as described above. The writer of the colophon has taken the trouble to compare the two editions, and to note the discrepancies in his own copy and supply what is lacking, including the short biography of the author at the end of the text. It is tempting to speculate on the identity of the writer, who signs himself “Jingxi” 景溪 in the eighth month of 1770 乾隆庚寅, with the seal “Huaidong” 懷東. The Backhouse Collection contains many books that were formerly in imperial collections and owned by famous scholars and statesmen, and it is possible that “Jingxi” may be Xi Ao 席鏊 (字景溪), a juren 舉人 graduate of 1729 who rose to the Grand Secretariat and knew a thing or two about poetry. The timing fits reasonably well, although the date of his death is not recorded, nor are the words “Huaidong” 懷東 on the seal. I have reproduced this and the other owners’ seals in my list, but unfortunately have not been able to identify any of the owners, nor to read all the seals with any certainty. Backhouse 477 is one of many books in the Backhouse Collection which were restored in Peking in the closing years of the Qing dynasty before being sent to Oxford from 1913 onwards. These books are models of the traditional art of Chinese book restoration at its height, and I used them when preparing the translation referred to at the end of my piece on Sinica 41. In fact, only by studying them was I able to understand what the Chinese manual was referring to. The most sophisticated restoration format is the so-called “jade set in gold” ( jinxiangyu 金鑲玉) binding. This allows the original leaves to be preserved almost untouched whilst at the same time allowing the interleaving leaves to be trimmed and thus present a pristine appearance to the reader. The name comes from an old story in which the jade seal of an ancient kingdom got broken, and was repaired by binding the pieces together with gold wire. The leaves of the book correspond to the broken jade pieces, and they are held together by the gold wire of the interleaving. But this is not possible with single leaves, for example the cover page of this copy. This could have been converted into a doubled leaf by extending it, but the restorer chose to encapsulate it rather than alter its original form, which would have had the additional disadvantage of using paste. The leaves from the second work in Backhouse 477 (which was supplied from a different edition) are smaller than those of the rest of the work, so they were extended to make them match. The paper used to make the extensions was dyed to make it harmonise with the original, but not so much as to make it identical. This is clearly visible in the illustrations above. Thus the approach of the traditional Chinese book restorer conforms with modern conservation requirements in so many ways: respecting the original, sacrificing no part of it, and ensuring that all alterations are visible and reversible. There is one final twist to the story of Backhouse 477. This is a list of the books printed by Mao Jin (although it is believed to be very incomplete), and it is of exceptional interest. 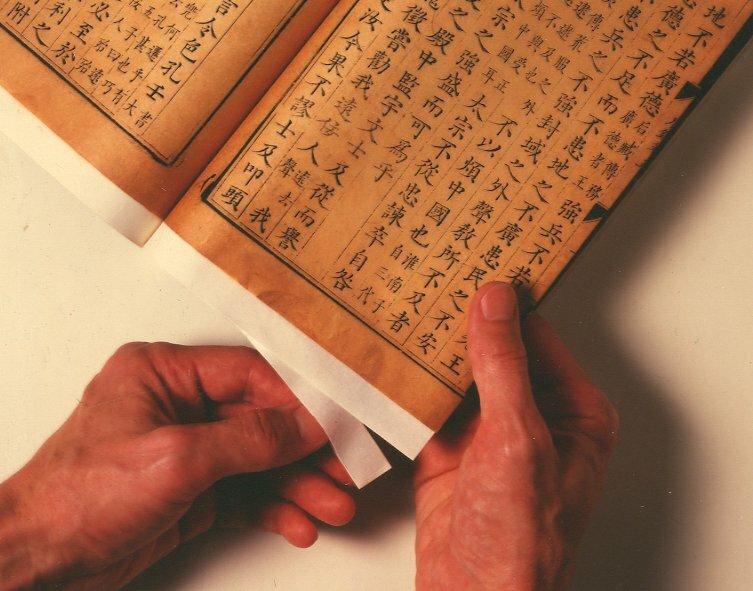 It starts with a list of titles together with a total page-count, but also contains an amazing section which tells us what happened to the printing blocks (刻板存亡考). In most cases this is not known, so the list is quite short, with only two dozen titles on three leaves. Also the details are usually quite brief, for example “blocks in the possession of Mr Jiang of Suzhou” (板存蘇州蔣氏), “blocks no longer in existence – edition copied by Mr Xia of Songjiang” (板已無 有松江夏氏翻板) and so forth. The blocks have been used as firewood for boiling tea water. The story goes that Mao Jin had a grandson who was fond of tea. He had bought some fresh new “Azure Vine” tea leaves from Mount Dongting, and some water from the Jade Crab Spring on Mount Yu. His only regret was that he lacked some good firewood. He therefore looked at the printing blocks of Four Tang poets, heaved a sigh and said: “If I use these to boil the water for my tea, it will taste twice as good.” And so each day he split a few of them up, and burnt them. Of the works in Four Tang poets, the Poems of Wu Rong is the best edition. Mr Xi also printed this title in his Works of one hundred Tang poets [the edition used to replace it in Backhouse 477], but his text is lacking as many as two or three hundred characters, so that people can’t read it properly. So the Jiguge edition is to be highly prized. The book is a collection of short philological pieces by the prolific Qing Dynasty scholar and philosopher Jiao Xun (1763-1820), a native of Yangzhou. The original manuscript is in the National Library of China, and was photolithographically reproduced in the 1990s (the publication is undated) in its series of rare editions in its own collections (北京圖書館古籍珍本叢刊 – the National Library of China was then still called Peking Library, and its publishing house was called Shumu Wenxian Chubanshe 書目文獻出版社). Although the blocks appear to have been finely cut, the quality of the impression is not at all good. There is a fuzziness which should not be present given that only one hundred copies had been taken from the blocks when we received ours – I have crystal-clear specimen impressions from blocks that were cut centuries before these, among them leaves from the Manchu Tripitaka and the Tetsugen Tripitika at Mampukuji near Kyoto. I think the reason might be partly due to the use of unsuitable paper. Owing to this extraordinarily small print run, the book is not widely distributed, and it may be that ours is the only copy in Europe. WorldCat shows eight copies in the United States, one in Taiwan, and one in Hong Kong. The only other copy I have found is in the National Library of China. It is very odd that none can be found in Japan. The National Library of China gives the imprint as 「南京 : 江蘇古籍出版社, 2001」. In WorldCat we find that nine of the ten libraries represented express the imprint as 「南京市 : 江蘇古籍出版社, 2001」 and one as 「揚州 : 廣陵書社, 2001」. It is depressing indeed that librarians continue to follow slavishly rules that were written on the back of an envelope (see John Joliffe’s work on the subject) rather than tell readers what an edition actually is. AACR and MARC were devised primarily for cataloguing modern printed books in English; traditionally produced Chinese books are about as far removed from that as it is possible to be. For this reason, I follow the traditional Chinese practice of expressing the edition of a book in a single sentence of classical Chinese. Thus, my statement for this edition tells the reader exactly how the book was produced and distributed; the WorldCat and NLC records do neither, and only one refers to Yangzhou – the whole point of the edition, as it was produced in homage to one of that city’s most famous scholars!